A two CD set for practice and recitation. One of the great supports for yoga practice is Patanjali’s Yoga Sutra, which presents the fundamental teachings of yoga in just 195 verses. Elegant in its presentation, the four chapters are each a separate and complete teaching, yet are also interdependent and complementary. When I teach a yoga class, I often find myself drawing directly on this text, which is full of clues to finding clarity and peace. One of my favourite verses, sthira sukham asanam (II-46) “asana must have two qualities, stability and ease,” gives the guidelines for safe practice and clarifies our aims in the physical dimension. Another, heyam duhkham anagatam (II-16), “future suffering should be anticipated and avoided,” sets our intention on the mental and emotional levels as well. So how does one approach the study of this rich yet sometimes difficult text? In my guest teaching I have often met both aspiring and certified teachers who get stuck on confusing translations or who just don’t know where to begin. In my own teacher training program we spend a full year on each of the first two chapters. This impressive text is so condensed that each verse or sutra can provide the basis for a single class or more: the literal translation (no English version I’ve seen actually translates word for word) is so succinct that each sutra needs commentary and discussion in order to bring out its application to life. With repeated reading, study and reflection, the wisdom held in these words resonates ever deeper. This kind of study could easily become dry or overly intellectual. However Indian tradition offers us a delightful way into the text through direct experience, through our ears and our voices, in chant. This is how study with a teacher opens the way. First one learns to chant by ear, with a back-and-forth interplay. This method directly enhances listening, cultivates attention and develops breath: there is immediate feedback, each sound is clearly articulated from moment to moment, and a rhythm of breath develops in the call-response of teacher and students. Then, when a sutra becomes familiar and is gradually learned by heart, the words become a reference point for the essential teachings and their meaning. This study of the sutras is a gradual one – I have been at it for over 30 years, with the help of my teachers, TKV Desikachar and Mary Louise Skelton, Sanskrit studies at the University of Toronto and many hours gathering and translating commentary. Each week I share and discuss this with my Yoga Sutra study group. As with any endeavour, time and practice bring their own fruits. 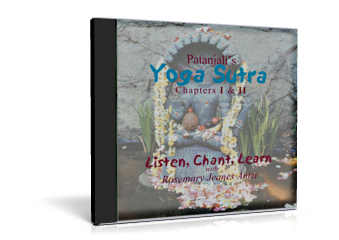 To help others in this process, I recently made a CD, Patanjali’s Yoga Sutra: Listen, Chant, Learn, a tool for individual study. Going through the recording process was a great learning experience. Working with a skilled musician and sound engineer, I chanted and reviewed the material, listening for articulation, meter, flow and pitch, while gradually honing each sutra. The result is over two hours of chanting, covering the first two chapters. This is how it works. First you listen to the whole chapter to get a general sense of the text. To practice gradually, you then listen to each phrase and repeat it yourself with the quieter echo which follows. Next you listen to the entire sutra and then repeat it with the echo. Each sutra is separately tracked so that the listener can gradually work from the beginning or choose a favourite verse to practice. Eventually you may join in reciting the entire chapter. To guide you along the way, I suggest you use the written chanting text which is available through the Krishnamacharya Yoga Mandiram (www.kym.org) and also refer to Desikachar’s translation which is found in The Heart of Yoga. Better yet, find yourself a teacher well-versed in this teaching. My hope is that this recording will set more serious yoga practitioners and teachers on this path of study, so rich and essential an accompaniment to asana, pranayama and meditation. This great text, Patanjali’s Yoga Sutra, gives us the teachings and the means to take our yoga practice back into our daily lives, for ourselves on our spiritual journey and in our relations with others.